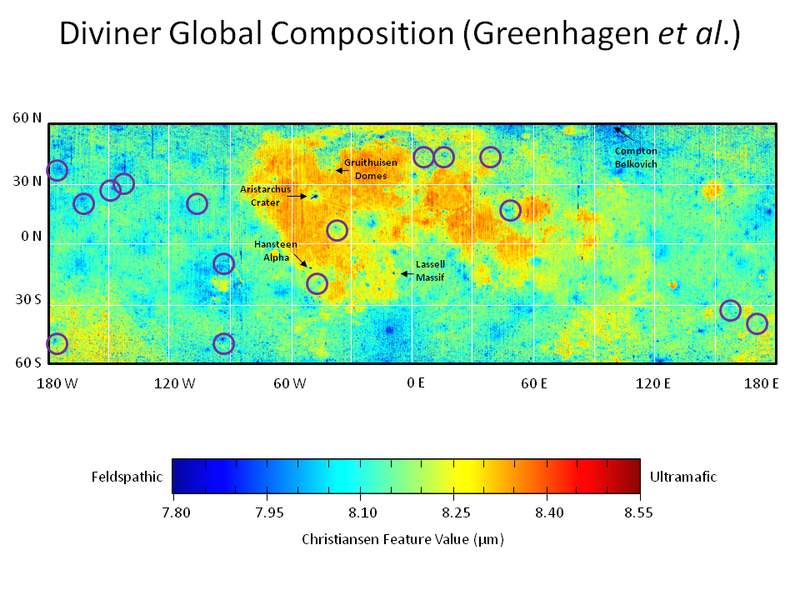 This map shows global compositional variations measured by the Diviner lunar radiometer aboard NASA's Lunar Reconnaissance Orbiter. The map is centered on the lunar nearside, which is visible from Earth, between 90 W and 90 E. The iron- and magnesium-rich maria appear red, while the calcium-rich highland appear blue-green. Highland areas with high silica (labeled) and enhanced sodium regions (purple circles) appear dark blue. 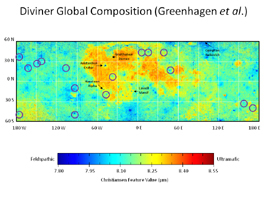 Diviner measures the wavelength position (microns) of a mid-infrared spectral feature called the Christiansen feature, which is correlated with silicate composition. JPL designed, built and manages the Diviner instrument for NASA's Exploration Science Mission Directorate, Washington. UCLA is home institution of Diviner's principal investigator, David Paige. NASA's Goddard Spaceflight Center, Greenbelt, Md., manages the Lunar Reconnaissance Orbiter. It is a NASA mission with international participation from the Institute for Space Research in Moscow. More information about NASA's Lunar Reconnaissance Orbiter mission is at http://www.nasa.gov/lro. More information about the Diviner instrument is at http://diviner.ucla.edu.